Our time is pinpointed by connectedness and dependencies. This is obvious in technology and natural sciences. Related to the human aspect, however, the connected and dependent surroundings are in a constant struggle and battle for attention. Multiple selves, sometimes contradictory, need devotion. It’s a game between dividing and integrating, about including and setting boundaries. How do we find the thin line, the balance where we can let our multifaced ‘I’ co-exist? We are moving into the co-era where Co-Existence is key. We are slowly freeing ourselves from hard capitalist and ego-centric influx. Reacting on social dilemma’s, exponential growth of technological possibilities, inequalities within the system and the need for sustainable solutions make us wonder: how is all this co-nnected? While things may seem to operate independently, they are actually part of a network, an ecosystem in which they co-operate or are correlated. This gives us a fertile breeding ground to explore and co-llaborate. We are not looking for the holy grail or final answer, but do search for a balance in our never ending quest. We are in need of a vision without limitations. Where can Co-Existence bring us? Where to search? 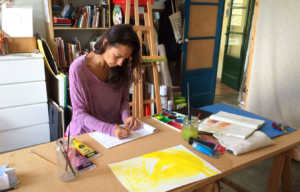 Mexican/French artist Beatriz Chamussy (1980) will be working on the solo-exhibition “Co-Existence” commissioned by In4Art and combined with an artist-in-residence program that will be held in May/ June 2017 in Amsterdam. Why this artist and what makes her ideal to work on this topic? 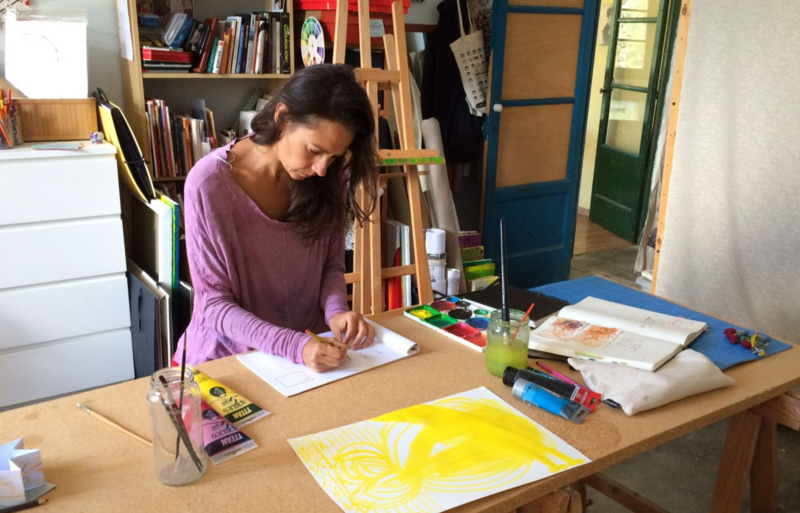 Beatriz Chamussy lives in Spain and works in her studio located in the green hills close to the vibrant city of Barcelona. She is ‘in transit’, being on the move and continuously researching how we relate to the fast changing environment around us. Her drawings and paintings tell stories, sometimes in a puzzled way on thoughts, objects and places that should not be forgotten. In transit from reality towards a dreamland, to what extend can they co-exist? Using ink, watercolour and acrylic on paper and canvas, she paints stories, objects and places that depict a playful and puzzled world. There is harmony in the abundance of details in her artworks. At the same time, the details do not stand alone, by themselves they wouldn’t survive, they co-exist by being part of a complex connected structure. This is just the beginning. The “Co-Existence” exhibition is work in progress. . The coming months we will update on Beatriz’s artwork progressions and our shared journey towards an co-created exhibition that aims to inspire and guide curiosity. *co-era: the time in which we are shifting to a more collectivist and shared approached through the amplified possibilities of COmmunication, COllaborating, COworking and COcreating. Excelente presentación del tema,de la artista y su trabajo; invita a darle seguimiento, y a esperar la presentación en mayo/junio 2017 en Amsterdam.